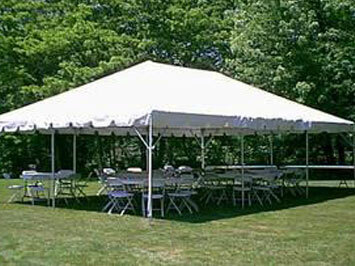 Our extensive experience with events of all types and sizes is what truly sets us apart. Our party rental and event experience includes thousands of backyard birthday parties, graduation parties, block parties, school carnivals, church festivals, company picnics, senior all night parties, and many more. Our large events include the Minnesota State Fair, MN Golf Show, several large city festivals and corporate events across the state. Our unbeatable experience along with great selection, competitive prices, full insurance, energetic staff and on time professional service make us the premier inflatable party supplier in Minnesota. Since 2001 we have taken a special interest in your parties to provide unmatched quality, service, safety and professionalism. Whether your event is large or small, indoors or outdoors, morning or afternoon, you can remain confident knowing USA Inflatables has the experience to handle your event. 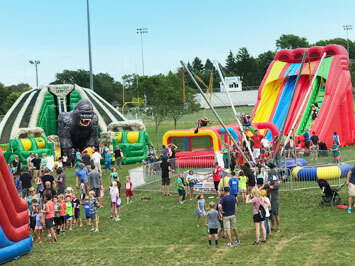 It's canival and festival time all across Minnesota, and USA Inflatables is ready to light up your events with excitement and fun. Our pro event consultants will guide you through every step of creating a successful event. 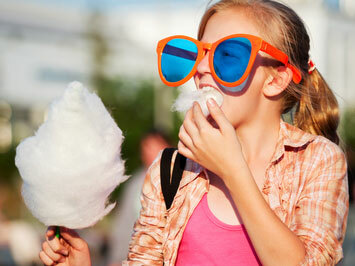 Choose from the largest inventory of awesome attractions and pro resources that will bring smiles to everyone's faces! Backyard birthday parties, family reunions, or sports team celebrations are what we do best, so let us help you with the party plans. USA inflatables has great deals on popular bounce rentals, inflatable games, and tents, tables & chairs, that will make you the "Party Hero" at your next gathering. Be sure to checkout our specials and packages today! "Excellent customer service! The employees answered all questions I had in a timely manner. The inflatable was set up and taken down just as describend and the guys were really helpful while they were here." 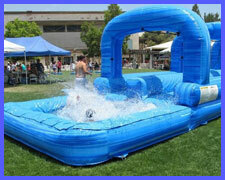 "The actual inflatable was clean and really nice, plus the price was fair! Yay~ I will definitely recommend to any one who is looking for a wonderful party!!" "Fantastic customer service all around for my daughters 7th birthday party weekend! The gentlemen who delivered and picked it up were so friendly and helpful! 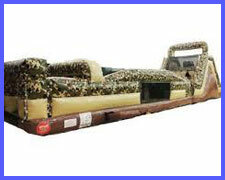 I would absolutely recommend this place to anyone wanting to rent an inflatable!" "I've ordered from here several time great service I will never order from any other company prices excellent and pick up and drop off is set up amazingly I recommend doing business with us a inflatables if u need inflatables." 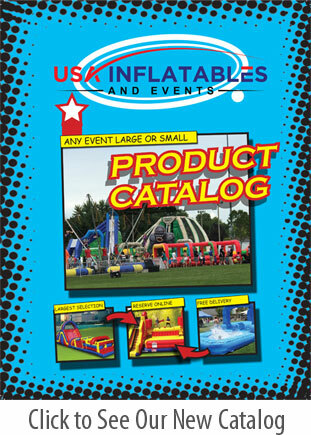 "USA Inflatables is reliable, customer service focused, always on time and delivers a quality product. We are a many-time repeat customer!" 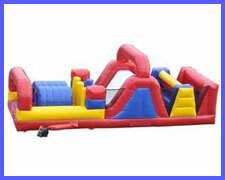 You can choose from over 200 inflatables, concessions, and bounce houses for rent MN. 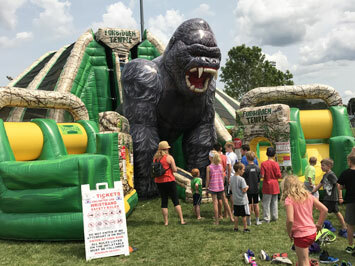 Every year, USA Inflatables brings a new level of fun to parties and events across the Midwest. That's why event planners and party coordinators always come to us first for excitement! 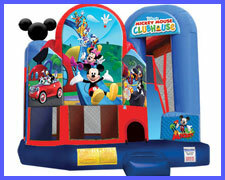 Since 2001, USA Inflatables has been providing the most reliable bounce house rentals party planners and parents require. 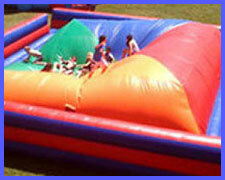 USA Inflatables stands out from other rental companies and bounce castles MN businesses. You can't have a bad party when you have a bouncer at your event. 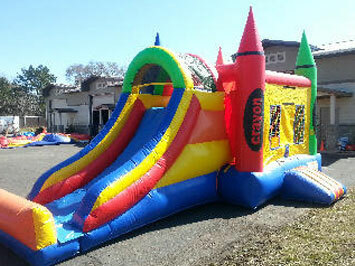 You get the best of both worlds when you reserve a Combo Bouncer from USA Inflatables! 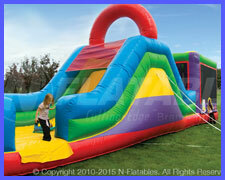 Add extra excitement combining a bounce house with a climb and slide, or small obstacles, and basketball hoop. Some even have a Water Slide combined with the bounce house. While it may be simple, a slide is one of most classic icons of "fun." At USA Inflatables, we've redefined this classic form of entertainment with giant inflatable water slides that bring "fun" to a whole new level. 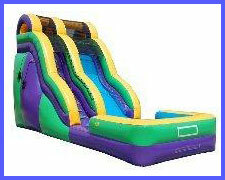 We provide the largest variety of slide rentals MN has to offer. In Minnesota, guests of all ages love our inflatable obstacle courses. Test your stamina and agility by racing a friend through one of our challenging courses. 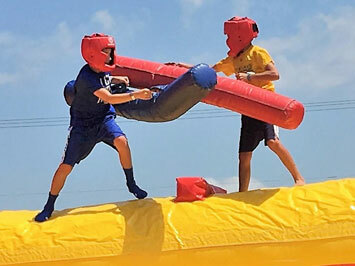 We offer a variety of Minnesota blow up obstacle course rentals of various sizes and difficulty, each with unique obstacle elements. Interactive inflatable rentals aren't just for kids! We have entertainment options for all ages. 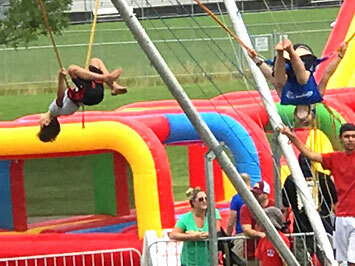 From bungee runs and gladiator jousting to mini golf and mechanical surfboards. 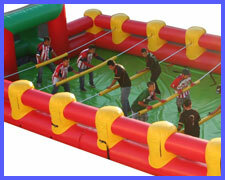 USA Inflatables has the perfect party solution for your upcoming event with over 75 interactive game options. 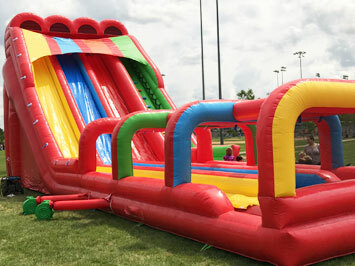 USA Inflatables is a leader in large attractions and interactive inflatables. We specialize in big cool stuff like the awesome Bungee Run, Virtual Golf Simulators, Bouncers, and Climbing Wall rentals. 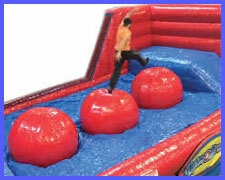 Our large event attractions & inflatables are great for engaging guests at any event. Bring some savory snacks to your event with a hot dog steamer or Minnesota popcorn machine rental. The aroma alone will be enough to put your guests in a festive mood. 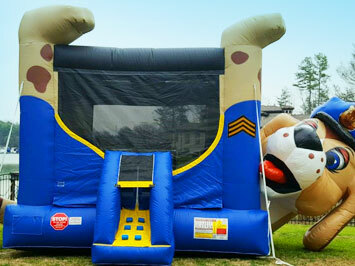 At USA Inflatables, we offer popcorn machines and the necessary supplies to keep your party popping all day long. At USA Inflatables we're ready to help our Minnesota event and party customers create awesome outdoor celebration spaces with our large inventory of classic commercial tent, and table and chair rentals. See our inventory here, and call if you have space configuration questions.